All systems are go for UC Davis Biodiversity Museum Day. Bugs rule, but other critters do, too, on UC Davis Biodiversity Museum Day! 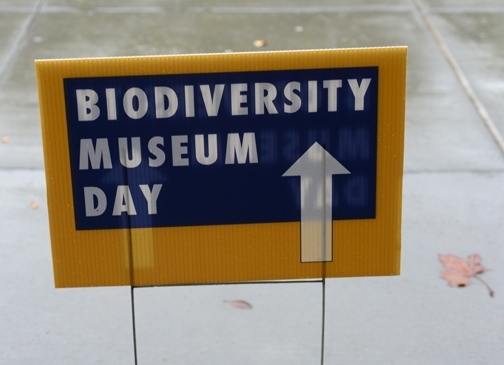 You won't want to miss the eighth annual UC Davis Biodiversity Museum Day, set from 9 a.m. to 4 p.m., Saturday, Feb. 16. The free, family friendly event will feature 13 museums or collections. Have you ever seen a chocolate tree loaded with fruit? Or a plant that folds its leaves when you touch it? No? Ever seen a Humboldt squid, a giant predator that's also known as a jumbo squid? How about a Peruvian sling shot? Or fossils more than 550 million years old? No? Ever watched scientists prepare a bobcat specimen for display? Or taken a selfie with a red-tailed hawk? Or petted a stick insect or a pine cone? How about kombucha tea--ever tasted it? You can do that and more at the UC Davis Museum Day. All are within walking distance except for the Häagen-Dazs Honey Bee Haven on Bee Biology Road and the Raptor Center on Old Davis Road. The hours vary from 9 a.m. to 1 p.m. and from noon to 4 p.m. The UC Davis Biodiversity Museum Day, always held the Saturday of Presidents' Day weekend, is billed as a “free, educational event for the community where visitors get to meet and talk with UC Davis scientists from undergraduate students to staff to emeritus professors and see amazing objects and organisms from the world around us.” Parking is also free. Maps are available on the Biodiversity Museum Day website at http://biodiversitymuseumday.ucdavis.edu/. All participating museums and collections have active education and outreach programs, Yang said, but the collections are not always accessible to the public. 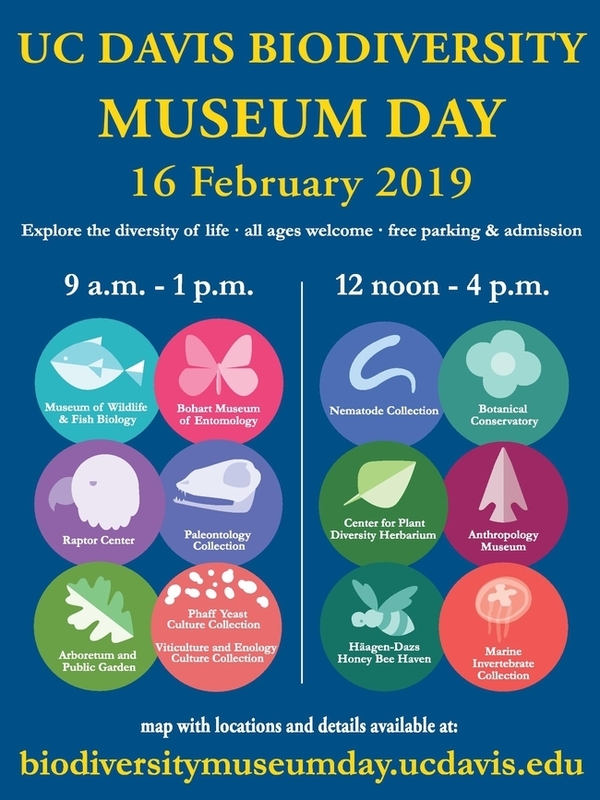 Maps, signs and guides will be available at all the collections, and also online at http://biodiversitymuseumday.edu, and on social media, including Facebook and Twitter, @BioDivDay. The Arboretum and Public Garden will present “investigation stations” from 9 a.m. to 1 p.m. at the Good Life Garden, next to the Robert Mondavi Institute, 392 Old Davis Road, on campus. Visitors will learn about the importance of bees, hummingbirds and moths as pollinators. They can play fun games, and color and craft their own pollinator pets. The Bohart Museum of Entomology, located in Room 1124 of the Academic Surge Building on Crocker Lane, will be open from 9 a.m. to noon, The Bohart is the home of a world-class collection of nearly 8 million insect specimens. Insect scientists will meet with the public to help them explore insects and spiders (arachnids). Highlights will include the 500,000-specimen butterfly/moth collection, curated by entomologist Jeff Smith. 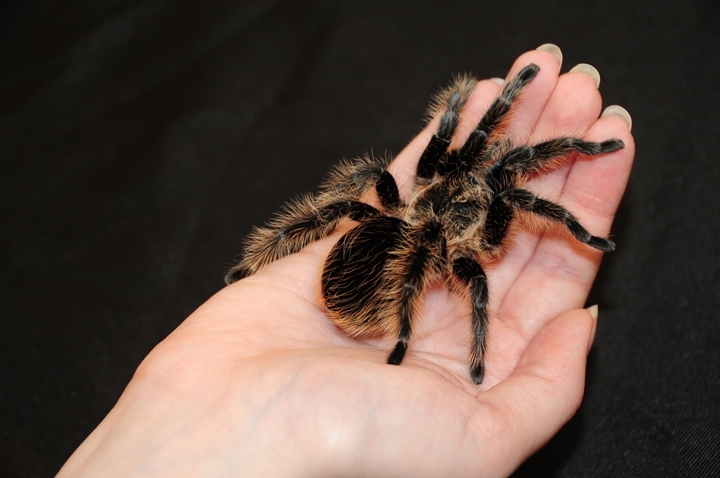 The Bohart maintains a live “petting zoo,” comprised of Madagascar hissing cockroaches, walking sticks and tarantulas. 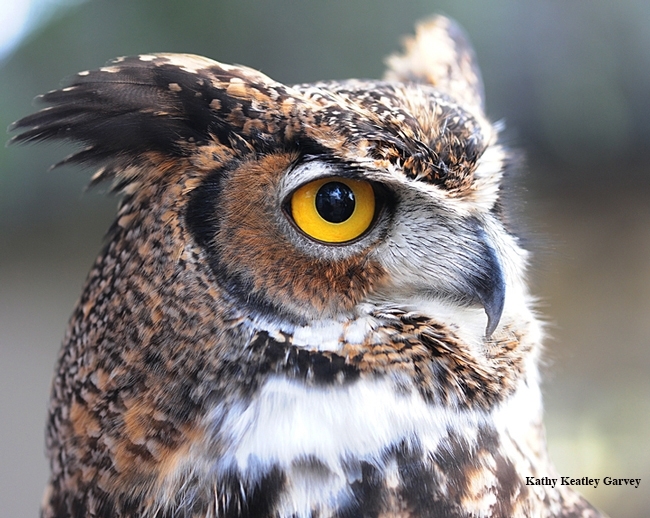 The California Raptor Center, located at 1340 Equine Lane, Davis, just off Old Davis Road, will be open from 9 a.m. to 1 p.m. Visitors will see a living collection of non-releasable raptors, including hawks, owls and a golden eagle. The center's educational ambassador birds will be out "on the fist", so visitors can get a close look and talk to the volunteers about the birds of prey that live in this area. The Paleontology Collection, located in the Earth and Physical Sciences Building, 434 LaRue Road, will be open from 9 a.m. to 1 p.m. Visitors can view fossil specimens dating from as old as 550 million years ago to more recent animal skeletons. Paleontology graduate students in invertebrate and vertebrate paleontology will answer questions and provide interesting factoids. 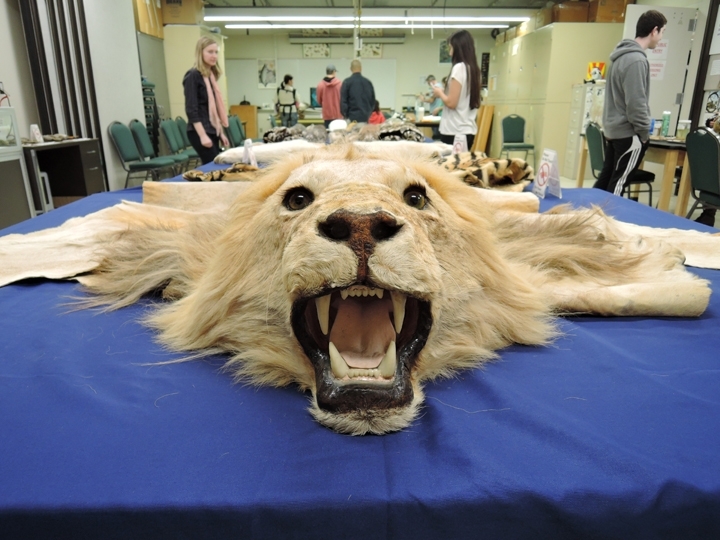 These collections will be open from 9 a.m. to 1 p.m. in the Robert Mondavi Institute,392 Old Davis Road, on campus. Visitors can learn about the importance of microbes in research, biotechnology, and food and beverages, and about the proud history of two of the world's prominent microbe collections. The Center for Plant Diversity Herbarium, located in Room 1026 of the Sciences Laboratory Building, central campus (off Kleiber Hall Drive), will be open from noon to 4 p.m.. Curator Ellen Dean said visitors can tour the collection area, see plant pressing and mounting demonstrations, “pet our plant zoo” (a table showcasing the diversity of plants, including mosses, pine cones, ferns and flowering plants); look and plants under a microscope, and view oak exhibit. The children's activity? Making herbarium specimens. Häagen-Dazs Honey Bee Haven, a half-acre bee demonstration garden located next to the Harry H. Laidlaw Jr. Honey Bee Research Facility, Bee Biology Road, will be open from noon to 4 p.m.. “The focus this year will be the link between bee health and human health through effective crop pollination and an overview of our research into bee plant preferences for common garden plants,” said manager Chris Casey. Also planned is a catch-and-release activity in which youths catch bees with a vacuum device, view them, and then release them. A six-foot long sculpture of a worker bee by artist Donna Billick of Davis anchors the haven, which was planted in the fall of 2009. The Marine Invertebrate Collection will open from noon to 4 p.m. in the Science Laboratory Building, off Kleiber Hall Drive. Visitors can view specimens collected from Oahu and Baja California, and live corals. There also will be a touch tank and Humboldt squid presentation.